Today for the equivalent price of a decent cup of coffee you can get the United States Postal Service to pick up and deliver a letter to anywhere in the continental United States in just a day or two. But it hasn’t always been that way and there’s a reason they call it “snail mail”. 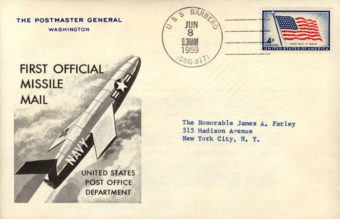 To get around the problem, for a brief time in the 1950s the USPS dared to dream big- like rocket ship big… Yes, on June 8, 1959, the then named U.S. Post Office Department, in conjunction with the US Navy, launched a rocket laden with what they officially dubbed MISSILE MAIL! Not the first to try sending projectile transmitted messages, arrows have been frequently used throughout history to send messages over rivers and castle walls and the like. In slightly more modern times, author Heinrich von Kleist suggested in an 1810 article titled “Useful Inventions” that shooting artillery shells loaded with letters would be a great way to rapidly send important mail throughout Germany via establishing a relay network of this type of artillery. That idea never got off the ground, but others who later had more or less the same idea had better success. For example, in the late 19th century in Tonga, residents of the island of Niuafo’ou decided to try using Congreve rockets to send and receive mail. You see, the island’s lack of beaches and harbour, as well as the presence of the second deepest oceanic trench in the world, the Tonga Trench, right next to it (making it impossible to anchor), meant getting mail from ship to land wasn’t something regularly done, despite ships frequently passing by. The ultimate solution to leverage the existing ship traffic here for sending and receiving mail was simply to have ships drop cans containing mail into the water and then blast their horns as they passed by. Strong swimmers would then swim out to try to collect the cans before the current did. Likewise, the swimmers would carry messages from the island out to the shipping lane to drop off, with the canned letters picked up when the ships passed. This all eventually earned Niuafo’ou the nickname of Tin Can Island. But before they earned that moniker, they decided to go with the Congreve rockets, which is definitely a missed opportunity here in terms of a more badass nickname. The order to fire is given – port-fire applied – the fidgety missile begins to sputter out sparks and wriggle its tail for a second or so, and then darts forth straight up the chaussée. A gun stands right in its way, between the wheels of which the shell in the head of the rocket bursts, the gunners fall right and left… our rocketeers kept shooting off rockets, none of which ever followed the course of the first; most of them, on arriving about the middle of the ascent, took a vertical direction, whilst some actually turned back upon ourselves – and one of these, following me like a squib until its shell exploded, actually put me in more danger than all the fire of the enemy throughout the day. Each rocket carries 200 to 300 letters from the starting point, the Shocket, to Radegund or Kunberg, in the neighborhood of Graz, whence the mail is forwarded by regular postal service. All of the mail rockets have functioned perfectly, each flight being made according to scheduled plans without the loss of a single letter. Bearing special “rocket mail” stamps, the letters are sealed in a metal container to prevent damage, but this precaution has been unnecessary, due to the accuracy with which the rockets have arrived at the destination. Unfortunately, despite the extreme success of the project, Schmiedl’s efforts were cut short when the Austrian Post Office killed funding for rocket mail. Also unfortunately for Schmiedl, at least in terms of his place in rocket design history, WWII began not long after. Afraid his work would be used to develop rockets, not to carry mail or for scientific usage, but to carry explosives, he destroyed the records of his designs and gave up on pursing rocket technology altogether, even when later offered a position to develop rockets in the U.S. after the war- he simply didn’t want any of his work to be weaponized. Going over to India, former dentist but then Secretary of the Indian Airmail Society, Stephen Smith, from 1934 to 1944 shot off about 80 rockets containing mail (and countless other experimental rockets without mail). On top of letters, he also in one instance shot a rocket containing food supplies to help earthquake survivors. In addition to that, on June 29, 1935, he successfully shot a rocket across the Damodar river. The payload? Two live chickens named Adam and Eve. They survived the ordeal just fine and spent the remainder of their days in a zoo. Like Schmiedl, unfortunately WWII saw Smith’s work curtailed and he died not long after the war ended. Going back across the pond to the U.S. and there are several instances of rocket enthusiasts using various rocket powered aircraft to send letters, including on February 23, 1936 when rockets were used to shoot a bundle of letters from Greenwood Lake, New York, to Hewitt, New Jersey, over a then frozen lake. While the rockets ultimately crashed after a flight of only about a half mile, their payload was successfully collected by a Hewitt postal worker and taken to the post office for further processing. This all brings us back to June 8, 1959 and the U.S. Postal Service jumping on the Rocket Mail delivery bandwagon, but in a massively more advanced way than had ever been tried before. Although purported to be an altruistic endeavour designed to test the feasibility of sending mail via missile, with the Postmaster General, Arthur E Summerfield, himself at the time waxing poetic about the potential the idea had, as far as the military was concerned, this was just a “a huge flex” aimed squarely at the Soviets. You see, the Cold War was just beginning to heat up and the sending of mail hundreds of miles via guided missile was seen by the Department of Defence as a great publicity stunt to use to show off the accuracy and precision of the United States’ nuclear arsenal. To this end, the missile chosen to carry the mail was a Regulus I- a cruise missile ordinarily tipped with a nuclear warhead that in this case had been replaced by two mail containers. Said containers were hand-loaded with the help of Summerfield. After this, he then headed off to the missile’s destination point. 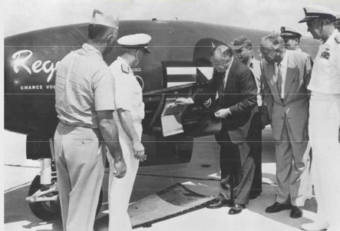 Being transported on that rocket were about 3,000 copies of a letter written by Summerfield addressed to everyone from the Postmasters of allied nations to President Dwight Eisenhower. 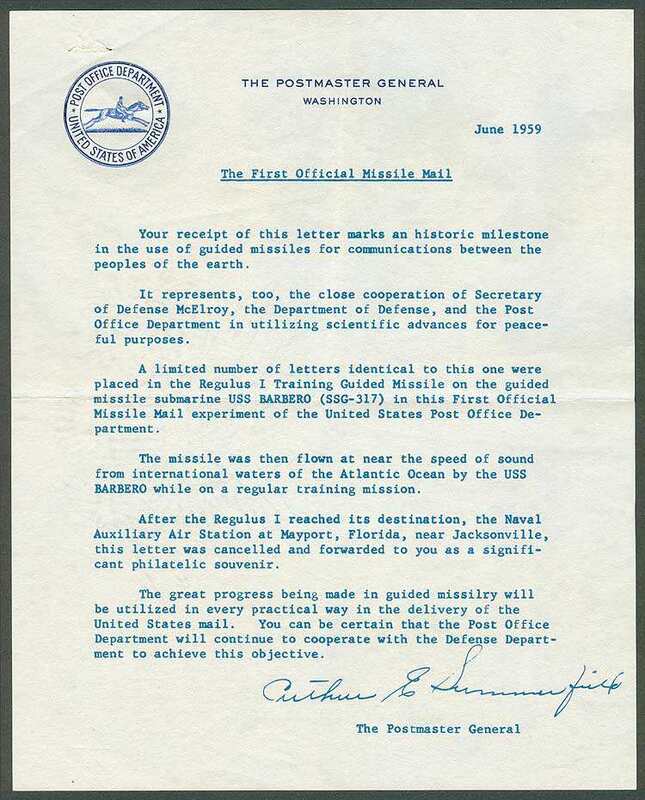 In addition, it’s noted that everyone aboard the submarine the missile was launched from also got a copy of the letter (shown below) as a sort of memento to the historic occasion. And, ya, beside the inherent awesome with regard to sending mail via rocket power, the missile was launched from the USS Barbero submarine. The target, for lack of a better term, for the missile was a Naval Auxiliary Air Station in Florida just under 200 miles away. Launched a little after noon on June 8, 1959, the missile landing safely after a mere 22 minute flight. As mentioned, Summerfield was waiting to hand collect the mail and from there the letters were taken to a post office in Jacksonville, Florida to be sorted like any other piece of mail. 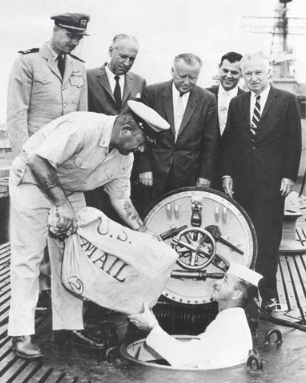 This peacetime employment of a guided missile for the important and practical purpose of carrying mail, is the first known official use of missiles by any Post Office Department of any nation. Before man reaches the moon, mail will be delivered within hours from New York to California, to Britain, to India or Australia by guided missiles. It’s unclear if Summerfield was in on the the fact the whole thing was intended as a show of force to the Soviets, as he seemed deadly serious about implementing rocket-powered mail more widely, even proudly reporting how the Post Office Department and Defense Department were going to work together to make the idea a reality in the famous Missile Mail letter. Despite Summerfield’s lofty claims about the prospects of rocket mail, the idea never really caught on. That said, other attempts have since been made, such as when XCOR Aerospace used one of its EZ-Rocket planes to carry mail for the USPS from Mojave to California City (about 180 miles or 290 km), demonstrating how in the perhaps not too distance future reusable rockets may make it economically viable to send physical mail and packages anywhere in the world within hours. What Happens to Undeliverable Mail with No Return Address? Do Mailboxes Have to Be “Approved by the Postmaster General”? Are the people who want to use drones to deliver mail aware?